Coconut Oil: A must use, healthy oil !! Coconut oil is extracted from the meat of mature coconuts harvested from the coconut palm. It has various applications, as a cooking medium, in medicinal preparations, as a massage oil and a base in cosmetics, and more. It is slow to oxidize, and hence doesn’t become rancid for a long time. There are several articles that discourage their readers from consuming coconut oil. This started in the west in the mid-80s when people were concerned that saturated fats can raise cholesterol levels, and hence exposure to heart disease. This stemmed from articles from the American Heart Association (AHA) which stated that all saturated fats raise total cholesterol and LDL cholesterol and, therefore, increase the risk of heart disease. What they failed to mention is that total cholesterol is NOT an accurate indicator of heart disease risk. They also don’t mention that saturated fats, including coconut oil, increase HDL cholesterol, the good cholesterol that reduces the risk of heart disease. Another fact they glossed over is that there are actually two types of LDL cholesterol: one that is small and dense, and another that is large and buoyant (called Large LDL). The large buoyant LDL cholesterol is also a form of good cholesterol. It is the type of cholesterol that the body generates to make bile, hormones, and vitamin D; it is essential not only for good health, but for life itself. The small dense LDL, however, is the type of cholesterol that becomes oxidized, which is unhealthy and can contribute to heart disease. Coconut oil by itself has no cholesterol. It increases HDL, large LDL, and reduces small dense LDL. The overall effect is that coconut oil reduces the cholesterol ratio, thus lowering the risk of heart disease. In fact, populations that use coconut oil as their primary source of fat have the lowest rates of heart disease in the world. 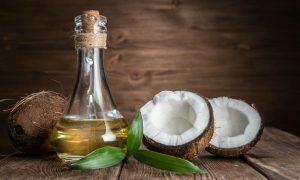 In India, all along the western coast, communities that use coconut oil extensively in their cooking have long life expectancies, and excellent hair and skin health. Fortunately, good sense prevailed in the long run, with many nutritionists, naturopaths, vaidyas, and doctors incorporating alternative healing systems fighting the good fight against propaganda and ignorance. Coconut oil is making a come back into the Indian kitchen, as well as into the western world, where it is establishing itself as a baking medium. Our coconut oil comes from Vasanthkumar’s family owned organic farm in Mysore, Karnataka. They grow rice and dal intercropped with vegetables and spices. The coconuts are harvested, split apart and dried, thus yielding the “copra”. The copra is then chopped up and crushed in a rotary press, which yields the “cold-pressed” coconut oil. The oil is made in Anand and Priya’s rotary press in Mysore, where they make cold pressed coconut, groundnut, sesame and sunflower oils. 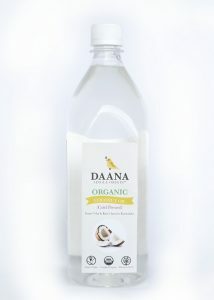 The oil is extracted from the first press, and hence is also called Virgin Coconut oil. This process uses an electric form of the traditional “kachchi ghani” to make the oil. In contrast, manufacturing of “refined” oils includes heating the mixture to very high temperatures, and using industrial solvents to extract maximum oil. This results in the breakdown of the chemicals in the oil, thus making it unhealthy. The presence of unnecessary chemicals makes it unhealthy as well. Read this article to understand why refined oils are a bad idea. Coconuts were introduced to southern India from Sri Lanka. The earliest reference to a coconut is in 160 BC, in the battles of King Duttagamini of Sri Lanka, where the warriors were armed with coconut trunks. The Tamil and Mayalalam word for coconut, “thengai” derives from “then-kay” which means “fruit of the south”. By the first century AD, coconuts were growing in plantations on the southwest coast of India. Coconuts have long been part of food culture in several societies along the coastal regions of East Africa, India, Sri Lanka, Laskhadweep, Maldives and South East Asia. They were introduced to West Africa and then the new world by the Portuguese and the Spaniards. 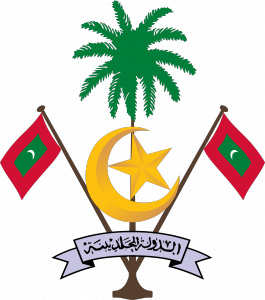 So integral is the coconut to life in Maldives, that the tree features in their national emblem. 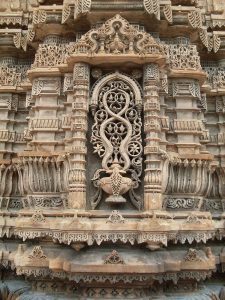 A sculpture of the Kalpa Vriksha by the entrance of the Jami Masjid in Ahmedabad. The Coconut is a versatile tree with multiple uses. In Sanskrit, it is called “kalpa vriksha”, the tree which provides for all the necessities of life. And that’s no exaggeration. In India, the trunk of the tree is used as timber, the leaves are used to make thatched roofing for low income houses, the inside meat, the milk, the coconut water and its flowers are edible. The dried fibre is weaved into coir ropes and other applications. The Indian Coir board has a list of very interesting products made of coir, including bio-degradable teabags made of coir 😊 Check them out here. In the Malay language, the coconut tree is described as “pokok seribu guna”, the tree of a thousand uses. In the Philippines, the coconut is commonly called the “tree of life”. The medical benefits, and applications of Coconut oil are described extensively in the Sushruta-Samhita, an ancient Ayurvedic text. From hair and skin ailments, to joint pain, and respiratory problems, coconut oil forms the base of many herbal massage oils, medicines and is recommended as a cooking medium. Hence, the coconut, not surprisingly has a special place in many Indian customs and rituals. The breaking of a coconut shell is done to pray for an activity to happen successfully. The Indian goddess Lakshmi is portrayed as holding a “purna-kunbham”, a pot of nectar with a coconut on top of it, symbolizing health and prosperity. The coconut palm thrives on sandy soils and is highly tolerant of salinity. It prefers areas with abundant sunlight and regular rainfall, which is why it is found in abundance along the shorelines of the tropics. Most other trees do not grow in highly saline soils. This also enables the coconut tree to get full sun exposure that it needs. Most of the world production is in tropical Asia, with Indonesia, the Philippines, and India accounting collectively for 73% of the world total. 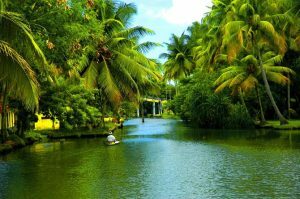 Traditional areas of coconut cultivation in India are Kerala, Tamil Nadu, Karnataka, Puducherry, Andhra Pradesh, Goa, Maharashtra, and the islands of Lakshadweep and Andaman and Nicobar. Sadly, in Goa, the coconut tree has been reclassified by the state government as a palm (like a grass). This enables people to not need a permission from the forest department before cutting a coconut tree. Read this article about the impact of the reclassification. Coconut is an entrenched ingredient in the cuisine of the coastal regions of India. From the Undhiyu of Surat, the Goan Xacuti, the Maharashtrian Narali Bhaat, Konkani subzi, Kerala Thoran, Tamil Nadu Aviyal, Kobbari-annam of Andhra, the mouthwatering Nadia-bara of Odisha, and the wonderful Jhinge-narkol of Bengal. Perhaps I should showcase these recipes one at a time to show how incredibly versatile coconuts and coconut oil is, in these recipes.